Cigar Advisor Magazine is a digital publication dedicated to providing cigar enthusiasts with entertaining and informative content. Their January 2014 issue features the much-anticipated conclusion of a fiction story begun in their November 2013 issue. This new chapter written by The Cigar Maker author, Mark McGinty, reveals the tense relationship between Vasquez, former owner of the Vasquez & Company Cigar Factory and Sanburn, a young, number-crunching New Yorker. The all-new Cigar Advisor is an online cigar magazine that brings a fresh, irreverent, and down-to-earth perspective on all things cigars to thousands of smokers. In addition to educational cigar content and behind-the-scenes cigar industry articles from some of the business’s top names, Cigar Advisor delivers an array of content about a variety of topics of interest to people who enjoy the cigar lifestyle. The magazine also features cigar reviews and ratings submitted by real smokers, and much more. Cigar Advisor Magazine has published a new fiction piece this month by contributor Mark McGinty, entitled, "The Slow and Graceful Death of the Tobacco Leaf: Part 2." 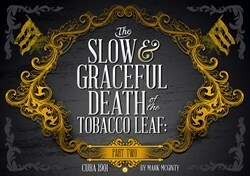 This new chapter written by The Cigar Maker author, Mark McGinty, reveals the tense relationship between Vasquez, former owner of the Vasquez & Company Cigar Factory and Sanburn, a young, number-crunching New Yorker sent by his corporate bosses at the American Tobacco Company to oversee their newly acquired operation. Vasquez, who lost his factory in a fire, has now been reduced to just another worker. "No longer could Vasquez plot the future of his company," writes McGinty. "The fire had reduced him from owner to foreman and now he reported to an American corporate type." Fortunately, Vasquez knows tobacco, which makes him valuable to Sanburn, who McGinty describes as someone who "knew the numbers but he didn't know the leaf." In addition to his duties as foreman, Vasquez tries to educate Sanburn on the intricacies of cigar making, yet the American is more concerned with modernizing the factory, heightening safety standards, creating incentives for the workers, and marketing opportunities. "Vasquez praised old-world traditions while Sanburn predicted how the Twentieth Century would unfold."